There are several reports dedicated to your triggered email sends, all found under the Analytics section of My Sailthru in the Triggered Sends menu. Summary page – Provides engagement-based and time-series reporting on triggered emails, such as Welcome or Abandoned Cart messages. 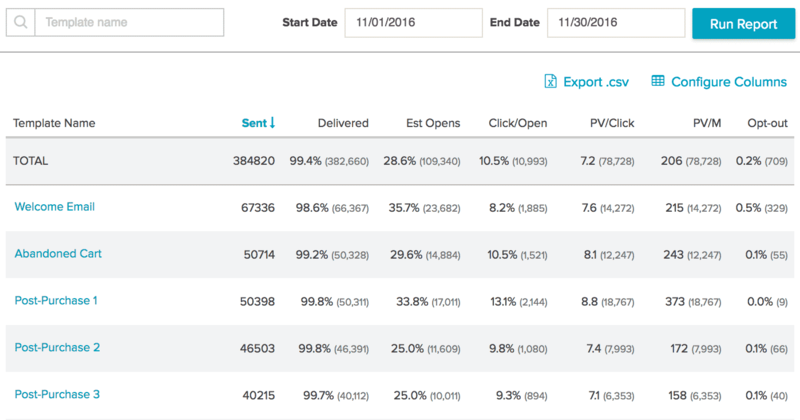 Delivery Rates Report – Provides engagement-based reporting on triggered emails, such as Welcome or Abandoned Cart messages. A/B Testing – Provides side-by-side engagement-based reporting on A/B split triggered templates. Triggered Send Log – Provides user-level triggered send reporting, including delivery status, send time, open time, and click time. You have the ability to view each individual user’s message and resend if desired. Please note this data is available for 90 days. Schedule Send Log – Provides all currently scheduled triggered messages. Legacy Triggers Log – Provides all deployed and scheduled trigger messages. Monthly Totals – Provides the total number of emails sent month over month, including campaigns, triggered sends, and both triggered sends and campaigns. To set a date range for data to display, use the Start Date and End Date entry fields and click Run Report. To determine which metrics to display in the table, click Configure Columns. Select Display Secondary Metrics to include the values used to calculate derived data points. Metrics with parenthesis will show the specified underlying data. For example, “Click to Conversion Rate (Purchases)” will show the rate, with the number of purchases in parenthesis. To filter by template name, type all or part of a name in the Template Name field at the top-left. To export the displayed data, click Export .csv. To view a Triggered Send Detail report for a particular template, click the template name. Used for designing both Campaign and Triggered emails, to set message content, user information, user interests, data feed content, and third-party advertising should all come together. The number of users who opened the email with images turned on. Users who opened the email with images turned on, or clicked through the email with images turned off. Confirmed Opens, plus the estimation of users who opened with images turned off but did not click. Clicks from a single user. Percentage of users who clicked on multiple links within one email message. 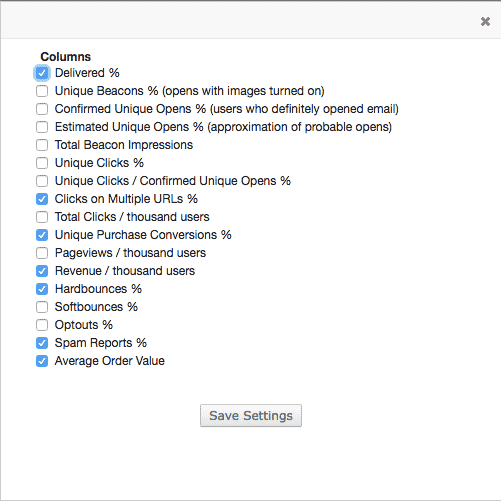 Purchase conversions as counted from individual (unique) users. A failed delivery of an email due to a permanent reason such as a non-existent address. Hardbounces are automatically removed from your valid list and will not be mailed to. Users who have chosen to not opt out of one or more lists. Opted out users will automatically be suppressed — not sent to — even if they are still on the list that you are mailing to. Average Order Value is calculated by the total purchase revenue over the total number of purchases. Note, this does not include ad revenue. The Delivery Rate Report provides a summary of metrics for your triggered emails. Use the Start Date and End Date entry fields to set the date range. Click on the Download CSV button to download the report. Use the Toggle Columns button to choose column headers in order to turn metrics on or off in your account. Click to view the Triggered Send Detail report. Click to edit the template via the Template Editor. The Triggered Send Detail Report is accessed from Delivery Rate report page by clicking . Displays the number of clicks received by each link (including those surrounding images). Those with no number displayed have not been clicked. For a list of metrics and their definitions, see the Delivery Rate Report Analytics Glossary above. Users may also be defined as Disengaged, Dormant or Optout. Triggered email performance grouped by users’ sign-up date. For natural lists, this is the date that the user was added to the list. For smart lists, this is the date the user profile was created. Triggered email performance grouped by users’ email domains. Only the top 20 domains are shown. Distribution of opens (beacon), clicks and/or purchases over time. Top performing links broken down by percentage of users who received that URL, Click Rate, Total Clicks, and any Purchases and/or Revenue generated from users who clicked through that URL. Breakdown of Engagement by various desktop, phone, and tablet devices. Only the top twenty devices are shown. The most active recipients of your campaign, measured by the number of links clicked. A/B Testing involves creating and send two (or more) slightly different versions of a triggered template to determine which one gets a better response from your users, usually measured by click and open rates. Use the Toggle Columns button to choose the metrics for column headers to view for each Template’s report. The Triggered Send Log shows a log of all of your recent triggered emails. Filter based on the template or date. View or resend a specific triggered email sent. Use the Template Filter dropdown menu to choose which template’s log you can see, and the Start Date and End Date fields to set the parameters for your report. Each Template is listed in the table with Email, Status (delivered, hard bounce, soft bounce, etc. ), Sent, Open, and Click. If Open and/or Click are blank, this indicates that the user did not open nor click-through the email. Click to view a copy of the Triggered message that was sent out to users. Click to resend the message to the user. View any scheduled trriggered mailing, the template being sent, the user’s Email Address and the Scheduled Time. Click to unschedule the message. Useful for debugging Trigger transactions. Use the Type dropdown menu to view both types, Scheduled or Executed. ID – The unique ID associated with that specific trigger. Scheduled – when the Triggered message was scheduled to send. Executed – when the send actually occurred. Message – The unique send ID. See send API for more information). Sailthru ID – The unique Sailthru ID. View your total sends by month for Triggered Emails, Mass Emails and Total Emails Sent.